EURUSD is illustrating support today. Swiss Franc is illustrating strength against the US Dollar. Gold and Silver are up today. Major US stock market indexes sold off this morning. Easy profit would be a broad short US Dollar position against all of the other major currencies, including the Chinese Yuan. Au I would suggest placing several Stop order for both correlated and non-correlated DXY trades. I’m thinking the dollar will reverse toward the 1st, making for 500 to 750 pips available in many pairs when that event occurs. I prefer a holding period greater than a week. Early in, early out. Swiss Franc illustrates super strength every day. I don’t think there is a better choice for the currency trading especially if you are just starting off. What do you think about it and what would you recommend newcomers? Also just wondering how did you start and which currencies pick up for the beginning? Uh…you kind of have to be careful about making statements like that. It is all subjective, sure I understand. Maybe, during their session, and maybe at a certain time everyday. Sure. But, that’s not the way I see it. In the context of this year, the Swiss is the most sold off currency. Massively. 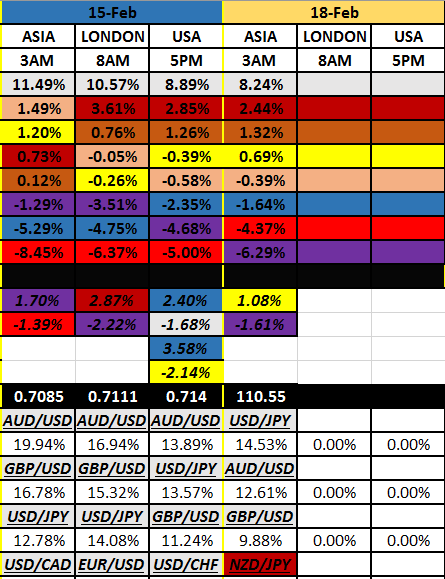 In the context of this month, Feb, there’s about 4 other currencies that are more bought. So, sure it’s important to understand in which context you are talking about. And therefore, it should be reflected in which time frame you are trading it. Everyone will be looking at different data. Time is everything, in this expertise. I keep track of them all on my thread. 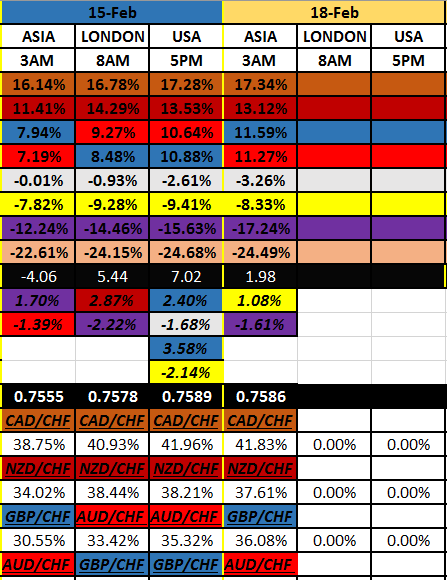 I started off with the USD-Major and Major-USD pairs including the Swiss Franc and New Zealand Dollar by strictly studying charts and taking into account central bank benchmarks. For newcomers I recommend setting buy-limit / sell-limit orders with take-profit limits and loose stop-loss. Hold out until it pays out, only take a loss if you realize your logic wasn’t accurate enough on a trade and not because you have a loss on paper.